The northern lights erupted in a stunning display Monday night (Sept. 3) after a recent solar storm, amazing skywatchers around the world. On Friday (Aug. 31), the sun unleashed a coronal mass ejection (CME), sending a huge cloud of charged particles streaking into space at more than 3.2 million mph (5.1 million kph), NASA researchers said. 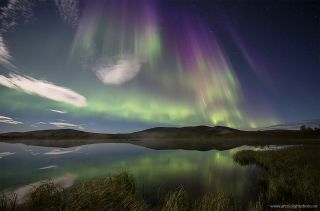 The CME delivered a glancing blow to Earth's magnetosphere, putting on quite a show for stargazers at high latitudes. Photographer Ole Salomonsen captured the supercharged northern lights — also known as the aurora borealis — from a forest near Naimakka, Finland. He drove about 120 miles (200 kilometers) to get there, as the weather wasn't cooperating in Tromso, Norway, where he lives and works. But the view was worth the international trip, Salomonsen said. "There I was standing all alone deep into the Finnish forest, just in awe of this display of light that happened above my head," he wrote in a Facebook post. Even a bright moon couldn't spoil the show, Salomonsen added. "A large moon is not normally optimal for watching auroras, especially not when it's not completely dark yet up here," he told SPACE.com via email. "But the moon actually contributed to absolutely magic photographic conditions, with the mist/fog over the lakes." NASA's Solar Dynamics Observatory spacecraft captured this massive coronal mass ejection (CME) erupting from the sun on Aug. 31, 2012. Big CMEs that hit Earth squarely can wreak havoc, spawning powerful geomagnetic storms with the potential to disrupt GPS signals, radio communications and power grids. But the storms resulting from Friday's CME — which occurred after an enormous filament erupted from the sun's surface — were minor and apparently had little impact aside from the ramped-up auroras. The northern and southern lights result when charged particles from the sun collide with molecules high in Earth's atmosphere, generating a glow. The auroras are usually restricted to high latitutes because Earth's magnetic field lines tend to funnel these particles over the planet's poles. Solar storms can increase both the intensity and reach of auroral displays, bringing them into view for more skywatchers around the world. After remaining relatively quiet from 2005 through 2010, the sun began waking up last year. It has fired off numerous strong flares and CMEs over the last two years, and researchers predict more such activity in the near future. Solar activity waxes and wanes on an 11-year cycle. Scientists think the current one, known as Solar Cycle 24, will peak sometime in 2013.